A boyar was a member of the highest rank of the feudal Bulgarian, Kievan, Moscovian, Serbian, Wallachian, Moldavian, and later Romanian aristocracies, second only to the ruling princes (in Bulgaria, tsars) from the 10th century to the 17th century. The rank has lived on as a surname in Russia, Ukraine and Romania, and in Finland, where it is spelled Pajari. Also known as bolyar; variants in other languages include Bulgarian: боляр or болярин; Ukrainian: буй[dubious – discuss] or боярин; Russian: боя́рин, tr. boyarin, IPA: [bɐˈjærʲɪn]; Romanian: boier, IPA: [boˈjer] ( listen); and Greek: βογιάρος. For the linguists, the title Boila is predecessor or old form of the title Bolyar (the Bulgarian word for Boyar). Boila was a title worn by some of the Bulgar aristocrats (mostly of regional governors and noble warriors) in the First Bulgarian Empire (681–1018). The plural form of boila ("noble"), bolyare is attested in Bulgar inscriptions and rendered as boilades or boliades in the Greek of Byzantine documents. Multiple different derivation theories of the word have been suggested by scholars and linguists, such as it having possible roots from old Turkic: bai ("noble, rich"; cf. "bey"), itself a derivative of beg, bag, from the Indo-European Iranic word bagh, "lord" – whence, Baghdad (lord-given), akin to Russian bog, Serbian bojh, "lord," plus Turkic är ("man, men"). The title entered Old Russian as быля (bylya, attested solely in The Tale of Igor's Campaign). The oldest Slavic form of boyar—bolyarin, pl. bolyari (Bulgarian: болярин, pl. боляри)—dates from the 10th century, and it is found in Bulgaria, where it may have stemmed from the old Bulgar title boila, which denoted a high aristocratic status among the Bulgars. It was probably transformed through boilar or bilyar to bolyar and bolyarin. In support of this hypothesis is the 10th-century diplomatic protocol of the Byzantine Emperor Constantine VII, where the Bulgarian nobles are called boliades, while the 9th-century Bulgar sources call them boila. A member of the nobility during the First Bulgarian Empire was called a boila, while in the Second Bulgarian Empire, the corresponding title became bolyar or bolyarin. Bolyar, as well as its predecessor, boila, was a hereditary title. The Bulgarian bolyars were divided into veliki ("great") and malki ("minor"). Presently in Bulgaria, the word bolyari is used as a nickname for the inhabitants of Veliko Tarnovo—once the capital of the Second Bulgarian Empire. In medieval Serbia, the rank of the boyars (Боjари, bojari) was equivalent to the rank of the baron; meaning "free warrior" (or "free man" in general), it was the first rank after the non-free peasants or serfs. The etymology of the term comes from the word battle (бој, boj); the boyars of Serbia were literally "men for the battle" or the warrior class, in contrast to the peasants; they could own land but were obliged to defend it and fight for the king. With the rule of the Ottoman Empire after 1450, the Ottoman as well as the Austro-Hungarian terms exchanged the Serbian one. Today, it is an archaic term representing the aristocracy (племство, plemstvo). From the 9th to 13th century, boyars wielded considerable power through their military support of the Kievan princes. Power and prestige of many of them, however, soon came to depend almost completely on service to the state, family history of service and, to a lesser extent, land ownership. Boyars of Kievan Rus were visually very similar to knights, but after the Mongol invasion, their cultural links were mostly lost. The boyars occupied the highest state offices and, through a council (duma), advised the grand duke. They received extensive grants of land and, as members of the Boyars' Duma, were the major legislators of Kievan Rus'. After the Mongol invasion in the 13th century, the boyars from central and southern parts of Kievan Rus' (modern Belarus and Ukraine) were incorporated into Lithuanian and Polish nobility (szlachta). In the 16th and 17th centuries, many of those Ukrainian boyars who failed to get the status of a nobleman actively participated in the formation of the Cossack army, based in the south of modern Ukraine. During the 14th and 15th centuries, the boyars of Moscow had considerable influence that continued from the Muscovy period. However, starting with the reign of Ivan III, the boyars were starting to lose that influence to the authoritative tsars in Russia. Because of Ivan III's expansionist policies, administrative changes were needed in order to ease the burden of governing Muscovy. Small principalities knew their loyal subjects by name, but after the consolidation of territories under Ivan, familial loyalty and friendship with the boyar's subjects turned those same subjects into administrative lists. The face of provincial rule disappeared. Boyar membership, until the 16th century, did not necessarily require one to be Russian, or even Orthodox, as historians note that many boyars came from places like Lithuania or the Nogais, and some remained Muslims for a generation after the Mongols were ousted. What is interesting about the boyars is their implied duties. Because boyars were not constitutionally instituted, much of their powers and duties came from agreements signed between princes. Agreements, such as one between Ivan III and Mikhail Borisovich in 1484 showed how allegiances needed to be earned and secured, rather than implied and enforced. Instead of the grand prince personally overseeing his lands, he had to rely on his captains and close advisors to oversee day-to-day operations. Instead of the great voice the boyars had previously in their advisory roles, they now had less bargaining power and mobility. They answered questions posed by the grand prince, and Ivan III even made sure to get their approval on special events, such as his marriage to Zoe Paleologa, or the attack on Novgorod. This was to ensure the boyars and their military power remained loyal to the tsar. The grand duke also made sure that peasants could not leave the princes’ lands, or from one place to another, in the mid-1400s, effectively establishing serfdom. The boyars gained rewards and gifts as well. Some boyars were sent to regions as governors, and could “feed off” the locals in this way. Still, by the end of the 15th century, boyar membership had declined, and merit rather than belonging to the family decided who became a boyar. Then Ivan IV became the tsar, and more radical changes were implemented. 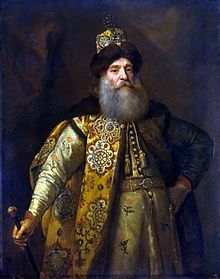 Ivan III became the grand prince of Muscovy in 1533 at the age of three, but various boyar factions tried to compete for control of the regency. When Ivan IV came to power in 1547, much more of the boyar's independent political power became obsolete. The independence and autonomy experienced by the princes of the regions in Russia was abolished under Ivan IV by the end of the sixteenth century, making them “the prince’s sons”, or just simple boyars serving the Grand Prince. Ivan IV divided Muscovy into two parts in 1565, and in the private part, the terror began. The boyars attempted to band together and resist, but instead of constitutionally establishing their role in government, Ivan IV ruthlessly crushed the boyar opposition with the use of the oprichnina terror. Land grants were also given to subjects that provided military service, and soon this type of land grant became the more common compared to inherited land among the boyars. Ivan IV consolidated his power, centralized royal power, and made every effort possible to curb the influence of the princes. After Ivan IV, a time of troubles began when his son Fedor, who was mentally deficient, died without an heir, ending the Rurik dynasty. The boyar Boris Godunov tried to proclaim himself tsar, but several boyar factions refuse to recognize him. The chaos continued after the first False Dmitriy gained the throne, and civil war erupted. When the Romanovs took over, the seventeenth century became one filled with administrative reform. A comprehensive legal code was introduced, and a merging of the boyars into the elite bureaucracy was beginning to form. By the end of the Time of Troubles, the boyars had lost nearly all independent power they had. Instead of going to Moscow to gain more power, the boyars felt defeated, and felt compelled to go to Moscow to maintain a united and strong Russia. Second, the boyars lost their independent principalities, where they maintained all their power, and instead governed districts and regions under the grand prince of the time. Boyars also lost their advisory influence over the grand prince with tools such as the duma, and instead the grand prince no longer felt compelled to listen to the demands of the boyars. Finally, the tsar no longer feared losing their military support, and unification of Russia became paramount in importance. With Peter the Great, the final nail in the coffin happened for the boyar's power, and they would never recover from his administrative reforms. Peter the Great, who took power in 1697, took it upon himself to westernize Russia, and catch it up with the modern world. After the revolt of the streltsy regiments in 1698, Peter the Great returned to Russia, forcing government officials and those that were financially able to have clean shaven faces and wear Western clothing. Peter also reformed the judicial system, and created a senate with members appointed by him, replacing the old council of boyars that originally advised the tsar. This move he made was one of many that dismantled the powers and status the boyars previously possessed. Peter was driving out the conservative and religious faction of the boyars out of the courts, and instead using both foreign and Russian officials to fill the administrative system. Several boyars, as well as other nobility, spoke out against these reforms, including historian Mikhail Shcherbatov, who stated that the reforms Peter made helped destroy Russian tradition, and created people that tried to “worm their way up, by flattering and humoring the monarch and the grandees in every way.” Still, the reforms continued, as by this point, the tsar possessed too much power, and Russia became an absolute monarchy more and more with each ruler. Being part of Ruthenia (also known in the Russian historiography as Kievan Rus), the Galician nobility originally were called boyars. With the annexation of Galicia by the Kingdom of Poland as the result of the Galicia-Volhynia wars, local boyars were equated since 1430 in rights along with Polish nobility (szlachta). A great number of boyars fled to the lands of Great Duchy of Lithuania in Volhynia and Podolia. In the Carpathian regions inhabited by Romanians, the boyar (boier) class emerged from the chiefs (named cneaz ("leader") or jude ("judge") in the areas north of the Danube, and celnic south of the river) of rural communities in the early Middle Ages, initially elected, who later made their judicial and administrative attributions hereditary and gradually expanded them upon other communities. After the appearance of more advanced political structures in the area, their privileged status had to be confirmed by the central power, which used this prerogative to include in the boyar class individuals that distinguished themselves in the military or civilian functions they performed (by allocating them lands from the princely domains). The Romanian social hierarchy was composed of boyar, mazil, and răzeș. Being a boyar implied three things: being a land-owner, having serfs, and having a military and/or administrative function. A boyar could have a state function and/or a court function. These functions were called dregătorie or boierie. Only the prince had the power to assign a boierie. Landowners with serfs but no function were categorized as mazil but were still considered to be of noble origin (din os boieresc, which translates literally as "of boyar bones"). Small landowners who possessed a domain without distinction (devălmășie) or serfs were called răzeși. According to some historians, they were descendants of mazil landowners. Although functions could only be accorded by the prince and were not hereditary, land possession was hereditary. The prince could give land to somebody but could not take it from its possessor except for serious reasons such as treason. Therefore, there were two kinds of boyars: those whose ancestors, as chiefs of the ancient rural communities, had held land before the formation of the feudal states, such that the prince merely confirmed their preexisting status as landowners; and those who acquired their domain from a princely donation or who had inherited it from an ancestor who acquired it through such a donation (cf. the distinction between Uradel and Briefadel in the Holy Roman Empire and in its feudal successor regimes). During the Phanariot régime, there were also boyars who had no land at all, but only a function. This way, the number of boyars could be increased, by selling functions to those who could afford them. 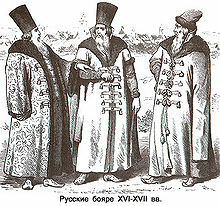 Boyars with gorlatnaya hats in a painting by Andrei Ryabushkin. The higher hats indicated higher social status. The close alliance between the boyar condition and the military-administrative functions led to a confusion, aggravated by the Phanariots: these functions began to be considered as noble titles, like in the Occident. In fact, this was not at all the case. Traditionally, the boyars were organized in three states: boyars of the first, second, and third states. For example, there was a first or a grand postelnic, a second postelnic, and a third postelnic, each one with his different obligations and rights. The difference of condition was visible even in the vestimentation or physical aspect. Only the boyars of the first state had the right, for example, to grow a beard, the rest being entitled only to a mustache. Within the class of the boyars of the first state, there was the subclass of the "grand boyars". Those were great landowners who also had some very high functions, such as the function of great vornic. Above those grand boyars was only the prince. Usually a prince was a boyar before his election or appointment as prince, but this was not an absolute condition. Initially, only princely descendants could be elected princes. During the Phanariot epoch, however, any man could be a prince if appointed by the sultan (and rich enough to buy this appointment from the grand vizier). During the Ottoman suzerainty, and especially during the Phanariot régime, the title of Prince became an administrative function within the imperial Ottoman hierarchy, and thus the ultimate form of boyardness. The title of Prince of Wallachia or Moldavia was equivalent in dignity to that of a pasha with two horse-tails. Norwegian composer Johan Halvorsen wrote a march entitled "Bojarenes inntogsmarsj" ("Entry March of the Boyars"), known in Norway as the signal tune for the radio programme Ønskekonserten. Edvard Grieg arranged it for solo piano. August Strindberg requests that this piece be played during his play The Dance of Death, Part One. ^ a b c Gustave, Alef (1967). "Reflections on the Boyar Duma". The Slavonic and East European Review. 45 (104): 76–123. JSTOR 4205832. ^ Bushkovitch, Paul (2004). "Princes Cherkaaskii or Circassian Murzas: The Kabardians in the Russian Boyar Elite, 1560–1700". Cahiers du Monde Russe. 45 (1/2): 10. JSTOR 20174844. ^ Kleimola, A.M (1972). "The Duty to Denounce in Muscovite Russia". Slavic Review. 31 (4): 762. doi:10.2307/2493761. JSTOR 2493761. ^ Gustave, Alef (1967). "Reflections on the Boyar Duma". The Slavonic and East European Review. 45 (104): 78. JSTOR 4205832. ^ Gustave, Alef (1967). "Reflections on the Boyar Duma". The Slavonic and East European Review. 45 (104): 79. JSTOR 4205832. ^ Vernadsky, George (1939). "Feudalism in Russi". Speculum. 14 (3): 315. JSTOR 2848599. ^ Alef, Gustave (1967). "Reflections on the Boyar Duma". The Slavonic and East European Review. 45 (104): 79. JSTOR 4205832. ^ Gustave, Alef (1967). "Reflections on the Boyar Duma". The Slavonic and East European Review. 45 (104): 109. JSTOR 4205832. ^ a b c d e f Curtis, Glenn. "Muscovite Period". Sam Houston State University. Library of Congress. Archived from the original on 21 May 2016. Retrieved 12 May 2016. ^ Vernadsky, George (1939). "Feudalism in Russi". Speculum. 14 (3): 318. JSTOR 2848599. ^ a b Vernadsky, George (1939). "Feudalism in Russi". Speculum. 14 (3): 319. JSTOR 2848599. ^ Kliuchevskii, V.O. (1960). A History of Russia, Volume 2 (PDF). New York: Russell and Russell. ^ a b c Kelley, J. (1991). Makers of the Western Tradition. New York: St. Martin's. p. 29. Wikimedia Commons has media related to Boyars. Wikisource has the text of the 1911 Encyclopædia Britannica article Boyar. Yaroslav Padokh, Andrii Yakovliv, Boyars in the Encyclopedia of Ukraine, vol. 1 (1984). This page was last edited on 3 April 2019, at 20:37 (UTC).